Here’s a handy list of uses for SiteBox Storage buildings, both conventional and unconventional! Creating a “tool crib” for a worksite is a great way to keep important tools onsite, and within reach. Quick, easy access to tools will save hundreds of man hours per year. With a variety of accessories available, like shelving units, wall dividers or bike racks, you can create a tool crib for quick, convenient and safe storage for all of the important tools you’ll need on your job site. You can easily move them from one site to the next. Theft of materials, equipment and tools is a common problem that costs site owners more than a billion dollars each year. Using a 20’ or 40’ portable storage building with a secure locking system helps eliminate easy opportunities to steal high ticket items. In retail, there are times when excess inventory is brought in to cover holiday upticks or special sales. With secure storage, either a ground level container or dock height trailer, retailers can bring in the inventory they need, when they need it, and not have to worry about upsetting the normal flow of always-available products. Portable storage container buildings are both wind and water resistant, so there’s no need to worry about your valuable items being permeated by the elements. Our buildings can also be quickly and easily deployed in disaster-relief situations for quick protection in an emergency. Site planning offices are a convenient place to review blueprints, make vendor calls, take care of all sides of the business. (Leaps and bounds better than the dashboard of your truck!) There’s no easier way to manage a project onsite than with a mobile office. When companies or individuals are renovating or remodeling, a storage container can provide the extra space needed while new fixtures are installed. It can help maintain the integrity of valuable belongings that are displaced during the remodel much better than simply throwing a tarp over them while working. A mobile office can even provide a work space as a temporary replacement for a workspace that is being remodeled or renovated, and it can even offer storage for the tools being used in the remodel. If the items being stored need to be frequently accessed or moved around, dock-height storage trailers are the way to go. They're easy for loading and unloading and, when the time comes, easy to move offsite. Just because we’ve designated our mobile office as “offices,” doesn’t mean you have to. If you’re an artist or musician, or another creative who has simply outgrown the “garage” studio, start thinking about how a storage container could be your solution. One of the most creative uses for a storage container must be the conversion to a lap pool. We've seen it done with one of ours and love the creativity! 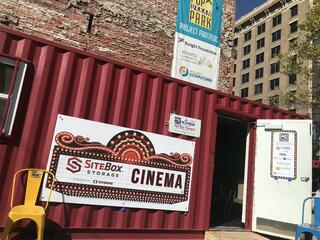 We've seen entire retail areas built entirely out of storage containers. 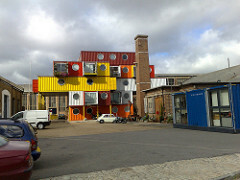 If you have a dream for a new development, why not start with a container or a whole village of them? If you have a creative idea and just need space, give us a call and see if our current container inventory suits your needs!